Plant this hand-blown glass hummingbird feeder to attract a flurry a hummingbird visitors. 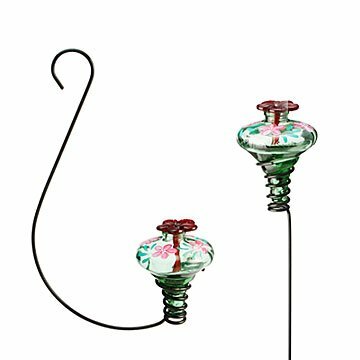 Plant or hang this hand-blown glass hummingbird feeder to attract a flurry of hummingbird visitors. Stylized after classic 1940s Mexican glassware, the delicate hand-painted garden essential is always in bloom. Fill the vessel with sweet nectar, and watch as these joyful birds hover and sip from the bright red flowers. Handmade in Mexico. Hand wash - fill with hot water every 3 days in warmer months to clean and prevent fermentation and mold. Before placing stake into the ground, screw feeder in place to ensure it is secure. For best results, do not place near competing bird feeders. Purchased the feeder with the stake for my mother and she loves it. It's gorgeous! In addition to attracting hummingbirds, it's a beautiful addition to any garden! It is beautiful. I hope it holds up to the elements. In addition to the artistry and the glass material, I love the way the feeder slightly screws into the holders - that was a smart idea! I bought the one to hang in the tree. You could also hang from a Shepherd's hook in the ground as well. My mother loves hummingbirds. She loves the gift. My dad was very impressed with the thick glass and hand painted details. This Hummingbird Feeder is beautiful! It's simple to set up and makes a wonderful gift. I have not heard whether it has brought any hummingbirds yet from the recipient, but either way it's a beautiful addition to any lawn! I also thought the card that came with it describing who makes it and where it comes from is such a nice touch. The glass hummingbird feeder is cute and the hummingbirds seem to love it - as did my cat when I had the stake (as in, the cat loved hunting the hummingbirds). When I changed to the hanging hook, this solved the cat problem, but the hanging hook is too short to be optimally attractive on my patio.